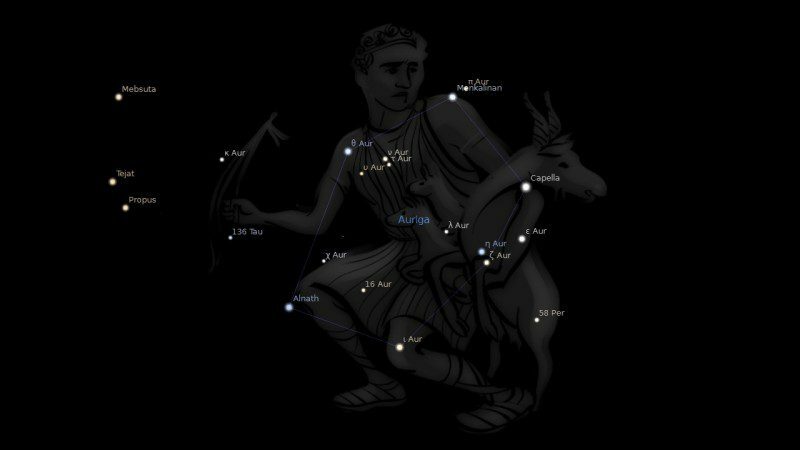 Constellation Auriga the Charioteer, is a northern constellation sitting above constellation Taurus and below constellation Cassiopeia, between constellation Perseus and constellation Lynx. Auriga spans 14 degrees of the Zodiac in the Sign of Gemini, and contains 9 named fixed stars. Auriga represents Erichthonius, son of Vulcan and King of Athens, who was the first to devise a chariot drawn by four horses which he used in order to conceal his greatly deformed feet. The goat and kids depicted in the constellation figure commemorate the goat upon whose milk Jupiter was reared, together with her offspring. Auriga, the Charioteer or Wagoner in early days the Wainman. It is a large constellation stretching northward across the Milky Way from its star gamma, which also marks one of the Bull’s horns, to the feet of Camelopardalis, about 30° in extent north and south and 40° east and west; and is shown as a young man with whip in the right hand, but without a chariot, the Goat being supported against the left shoulder and the Kids on the wrist. This, with some variations, has been the drawing from the earliest days, when, as now, it was important, chiefly from the beauty of Capella and its attendant stars so prominent in the northwest in the spring twilight, and in the northeast in early autumn. But the Hyginus of 1488 has a most absurd Driver in a ridiculously inadequate four-wheeled car, with the Goat and Kids in their usual position, the reins being held over four animals abreast — a yoke of oxen, a horse, and a zebra (! ); while the Hyginus of Micyllus, in 1535, has the Driver in a two-wheeled cart with a pair of horses and a yoke of oxen all abreast. A Turkish planisphere shows these stars depicted as a Mule, and they were so regarded by the early Arabs, who did not know — at all events did not picture — the Driver, Goat, or Kids. In this form Bayer Latinized it as the Mulus clitellatus, the Mule with Panniers. Ideler thinks that the original figure was made up of the five stars alpha (Capella), beta (Menkalinan), epsilon, zeta (Haedi1), and eta (Haedi11); the Driver, represented by alpha (Capella), standing on an antique sloping Chariot marked by beta (Menkalinan); the other stars showing the reins. But later on the Chariot was abandoned and the reins transferred to their present position, the Goat being added by a misunderstanding, the word Aix, analogous to Aigis, simply meaning a Storm Wind that, apparently, in all former times the stars alpha (Capella), eta (Haedi11, and zeta (Haedi1) have portended at their heliacal rising, or by their disappearance in the mists. Still later to alpha as the Goat were added the near-by eta and zeta as her Kids, the Eriphoi, — an addition that Hyginus said was made by Cleostratos. But the results of modem research now give us reason to think that the constellation originated on the Euphrates in much the same form as we have it, and that it certainly was a well-established sky figure there millenniums ago. A sculpture from Nimroud is an almost exact representation of Auriga with the Goat carried on the left arm; while in Graeco-Babylonian times the constellation Rukubi, the Chariot, lay here nearly coincident with our Charioteer, perhaps running over into Taurus. The Charioteer lifts his team from ocean and wrests his wheels up from the downward slope of the horizon where icy Boreas lashes us with his bitter blasts. He will impart his own enthusiasms and the skills, still retained in heaven, which as driver of a chariot he once took pleasure in on earth. The Charioteer will enable his son to stand in a light chariot and hold in check the four mouths curbed with foam-flecked bits, guide their powerful strength, and keep close to the curve round which they wheel. Again, when the bolts have been drawn and the horses have escaped from the starting-pens, he will urge on the spirited steeds and, leaning forward, he will seem to precede them in their swift career; hardly touching the surface of the track with his light wheels, he will outstrip the winds with his coursers’ feet. Holding first place in the contest he will drive to the side in a balking course and, his obstruction delaying his rivals, deny them the whole breadth of the circus-track; or if he is placed mid-way in the press, he will now swing to a course on the outside, trusting in the open, now keep close to the pointed turning-post, and will leave the result in doubt to the very last moment. As a trick-rider too he will be able to settle himself now on one, now on a second horse, and plant his feet firmly upon them: flying from horse to horse he will perform tricks on the backs of animals in flight themselves; or mounted on a single horse he will now engage in exercise of arms, now whilst still riding pick up gifts scattered along the length of the circus. He will possess virtuosity in all that is connected with such pursuits. We have had the picture of a mighty Bull rushing forth; then the fiery river of the Judge; and now we see a Great Shepherd. He is seated upon “the milky way,” holding up on his left shoulder a she goat. She clings to his neck, and is looking down affrighted at the terrible on-rushing Bull. In his left hand he supports two little kids, apparently just born, and bleating, and trembling with fear. AURIGA is from a Hebrew root which means a shepherd. It is a beautiful constellation of 66 stars; one of the 1st magnitude, two of the 2nd, nine of the 4th, etc. 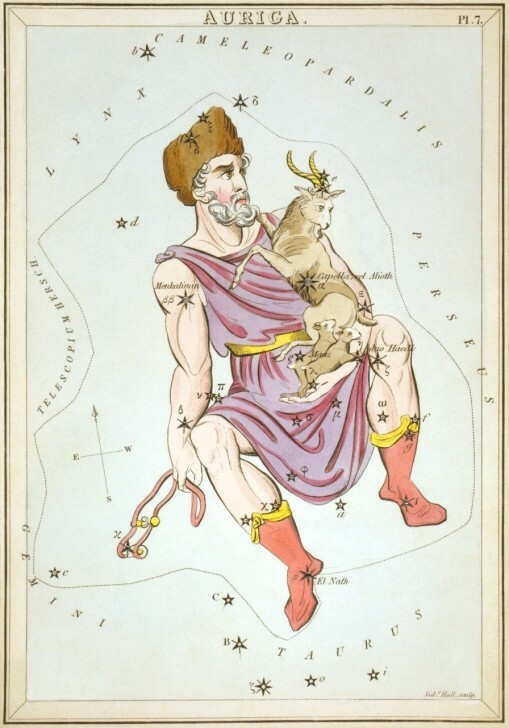 The brightest star, α (in the body of the goat), points her out as the prominent feature of the constellation, for its name Alioth (Hebrew) means a she goat. It is known by the modern Latin name Capella, which has the same meaning. 1. Fixed Stars and Constellations in Astrology, Vivian E. Robson, 1923, p.31-32. 2. Fixed Stars and Judicial Astrology, George Noonan, 1990, p.15-16. 3. Star Names: Their Lore and Meaning, Richard H. Allen, 1889, p.83-85. 4. Astronomica, Manilius, 1st century AD, p.305-309. 5. The Witness of the Stars, E. W. Bullinger, 31. Auriga (the Shepherd).